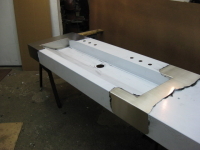 WE ARE A CUSTOM SHEET METAL FABRICATOR LOCATED IN LODI NEW JERSEY. SINCE 1976 AMERIFAB HAS PROVIDED QUALITY AND SERVICE TO ITS CUSTOMERS. WE WELD AND FABRICATE WITH ALL MATERIALS SUCH AS STAINLESS STEEL, ALUMINUM, CARBON STEEL, GALVANIZED, BRASS, BRONZE, MUNTZ, AND COPPER.